Dr. Erika Kinser joins CCGD in 2013 as accompanist for the Youth Chorus; Dr. Kinser previously served as Concert II accompanist from 2005-2008. Dr. Kinser maintains a busy schedule as a performer, teacher, collaborator, adjudicator, presenter and author. Before moving to Dallas, she was an adjunct professor of piano at MidAmerica Nazarene University in Olathe, Kansas where she taught music majors, designed curricula, and coordinated the class piano program. 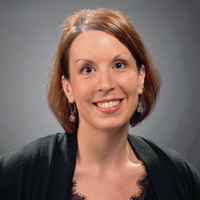 Dr. Kinser holds a Bachelor of Music degree in Piano Performance from the University of Oklahoma, a double master’s degree in Piano Performance and Pedagogy from Southern Methodist University, and Doctor of Musical Arts degree from the Conservatory of Music at the University of Missouri-Kansas City. In addition to teaching and performing, Dr. Kinser has a passion for art entrepreneurship and has been published on the subject, as well as designed a workshop for music teachers on the business aspects of music studios that she has presented on the local, state, and national levels. She holds affiliations with the College Music Society, Music Teachers’ National Association, and the honorary music fraternity, Pi Kappa Lambda.